Wednesday evening, Palmeiras’ Steering Committee elected opposition candidate Arnaldo Luiz de Albuquerque Tirone, nicknamed “Pituca”, the new president of the club. His mandate runs for two years. Pituca, age 60, is the son of Arnold Tirone, a well known profile within the club during the 60s and the two decades that followed. Tirone received 158 votes against main opponent Paulo Nobres’ 96 votes. 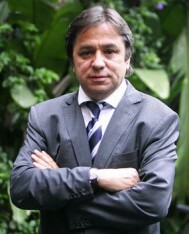 Salvador Hugo Palaia received 21 votes. In addition, the opposition, led by former Palmeiras president Mustafá Contursi, won all four nominations for vice president, thus electing Roberto Frizzo (who will head the football department), Edvaldo Frasson, Mario Giannini and Walter Munhoz as 1st, 2nd, 3rd and 4th vice presidents respectively. Adding insult to injury, the opposition also elected a large majority of new consiglieri to the Steering Committee. During Mustafá Contursi’s years in power, something resembling a dictatorship was installed at Palmeiras; critics of the administration were blacklisted, harassed, even excluded from the club. The coming few months are surely going to give us an indication of to what extent Mustafá will be able to exercise influence over Tirone’s presidency (the lesser the better, needless to say). In order to seal his family name’s reputation, Tirone must not let himself be manipulated by the shadier elements constantly present on Palmeiras’ political stage. Putting Palmeiras’ interests first must always be his priority, strengthening the club while promoting a transparent and ethical management. Good luck to Tirone; may his presidency be surprisingly glorious and rewarding for all of us and for Palmeiras in particular. Ugly politics are one of the main problems Palmeiras have had to deal with in this decade. In this sense I even have to admit a grudging respect for Sao Paulo their organized leadership has, until very recently, being key to their successes. Agree. I guess it goes with the history; Palmeiras is so much more than a club, it’s the life and soul of a whole community. With that comes the good and the bad. Let’s face it: Italian politics, even (or particularly?) in ancient times has always been a matter of power plays, exchange of favours, backstabbing and inflated egos. The legacy is undeniable.